Having made my way out the Military Aviation Museum in Virginia Beach (the destination of my wandering about that day, as I noted in my last post here), I was pleasantly surprised to find not only a B-17G parked out back, but a Junkers Ju-52 trimotor transport plane from WWII. And, of course, it had some German heraldry on its nose. With a really great heraldic hunting horn painted on its side. 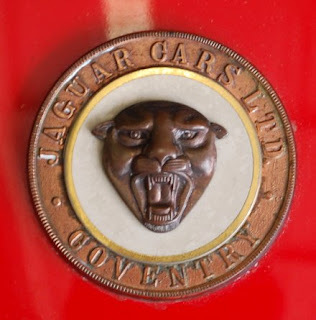 With that great Jaguar Cars Ltd. logo of a jaguar’s head cabossed (face on, with no neck showing). What a great way to spend a part of the day! 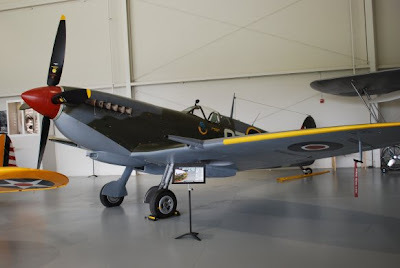 Having some free time before my presentation in Virginia Beach, I thought I’d go back out to the Military Aviation Museum they have there and see some more old airplanes. 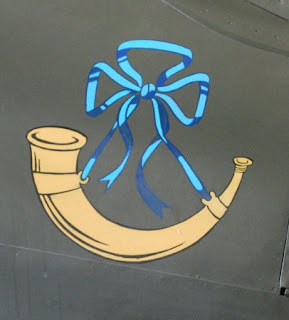 (Long before I got bitten by the heraldry bug, I was a WWII aviation enthusiast.) 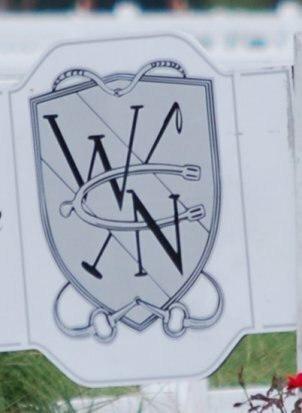 But, as I have noted before, you can find heraldry everywhere, and on my way to the museum I passed the West Neck Creek Equestrian Center. Which has, for its logo, a semi-heraldic design. If I had to try to blazon it, it would be something like: Argent, a polo mallet bendwise sinister azure surmounted by a bend argent, overall a spur fesswise argent interlaced in bend with the letters W and N sable. The shield is “supported” (or surrounded) by a bridle and bit. 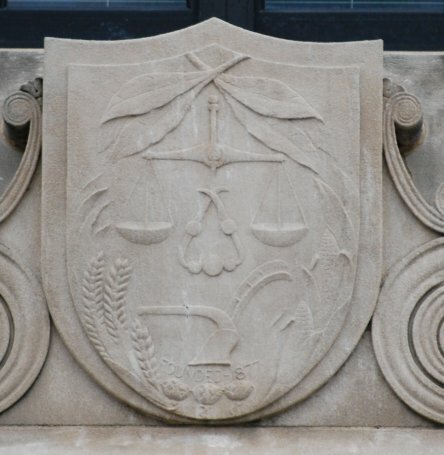 Hey, just because you can find heraldry everywhere doesn’t mean that it’s always pretty. 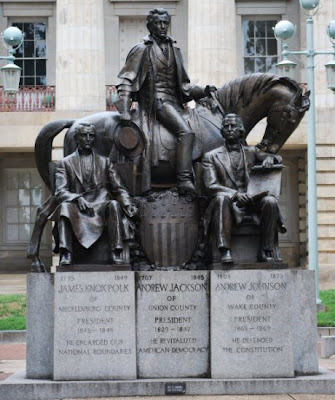 I traveled to Virginia recently to give another presentation to the Virginia Beach Genealogy Society. They're a really nice bunch of folks, and I was tickled pink to be asked back by them. 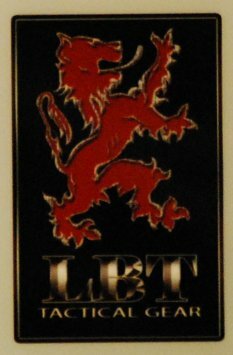 I was packing light, but had pulled the shirt I wanted to wear for the presentation out of the wardrobe, and had checked it against several of my heraldic ties to decide which one of those I wanted to take with me to wear at the presentation. So far, so good. 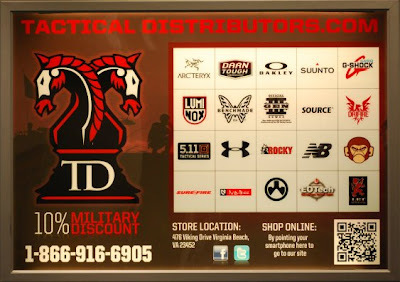 Then I arrived in Virginia Beach and unpacked. No tie. Apparently, I had left the tie in the tie rack in the wardrobe. So I had to do some emergency shopping. 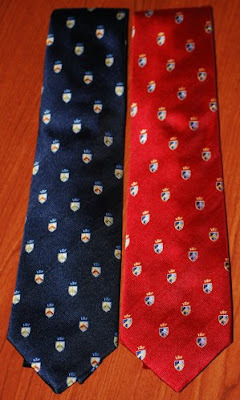 Do you know how hard it is to find a necktie with an heraldic theme when you’re actually looking for one? I went to the nearby mall, with several large department stores. No heraldic ties. I went to a couple of men’s shops in the mall. No heraldic ties. I finally ended up at a Men’s Wearhouse nearby – the fifth store I tried – and Bingo! Not one, but two ties with an heraldic theme. I was saved! And now, I have what I think of as my two "Virginia Beach Emergency Backup Ties." Unless, of course, I forget to pack them, too. Fitzalan has also advised on matters of aristocratic living, such as how gentlemen of the day should sit correctly while wearing tails, and if asparagus should be eaten at the dinner table with fingers – or without. A week after out trip to North Carolina, we were back in Las Vegas, Nevada, where family members have lived since 1963. I didn’t have a lot of “free” time to go searching for heraldry, but did run across the following sign incorporating a coat of arms between my mother’s home and the hotel where we were going to be staying. 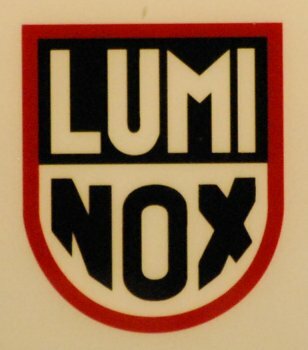 Still, I have to wish they hadn’t just used the arms of Berne for their heraldic logo. 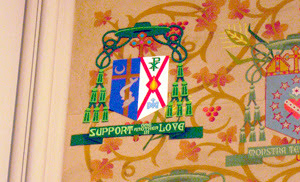 A recent (August 9, 2011) article in The Catholic Sun goes into some detail about the addition of arms (five feet high by four feet wide, forty feet above the floor) of Bishop James M. Moynihan, Bishop Emeritus of the Syracuse Diocese, painted in the apse of the Cathedral of the Immaculate Conception, as well as a very brief discussion of the use of ecclesiastical heraldry in general, including the earliest use of a coat of arms by a pope (Pope Innocent III, 1198-1216). 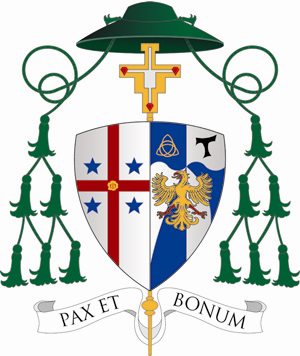 Overall it’s a decent article (though I don’t recall having seen a saltire called a “saltair” before), and discusses the symbolism of the diocese’s and the bishop’s arms. 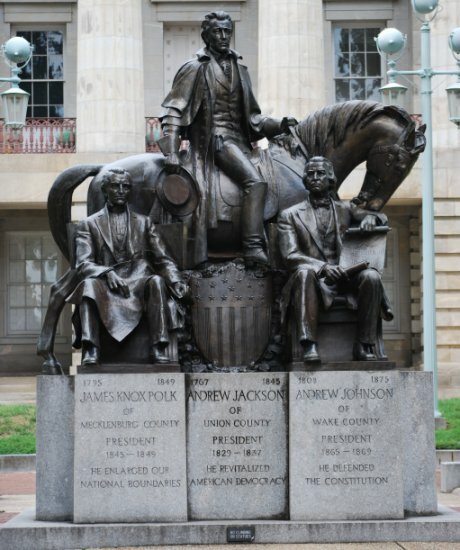 Also found on the grounds of the North Carolina state capitol in Raleigh is a monument to the three Presidents of the U.S. from North Carolina: Andrew Jackson, 1829-1837 (center); James K. Polk, 1845-1849 (left); and Andrew Johnston, 1865-1869 (right), and prominent in the center, the arms of the United States. Well, no, not exactly. Even if we go ahead and assume that they are not using the usual Petra Sancta hatching for red (vertical lines), so that these here are the expected seven white stripes and six red ones (the official blazon is Paly of thirteen argent and gules), the arms of the United States do not have stars on the chief. In the example here, there are thirteen stars, representing the thirteen colonies which broke away from England and later formed the United States. The addition of stars to the chief on the arms of the U.S. is, alas, a common error. 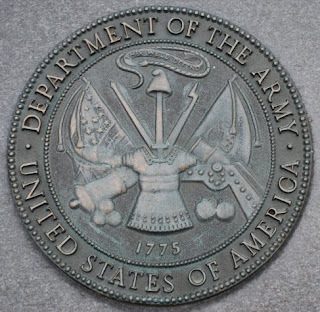 For that matter, I have also found a number of depictions of the U.S. arms with seven red stripes and six white ones. Both of these errors mimic the national flag, but are not really a part of the coat of arms. So here we have a case where familiarity doesn’t breed contempt, exactly, but it does become the basis for error. Alex Singleton at the Mail Online has a gripe -- apparently he finds the Court of the Lord Lyon of Scotland to be "the silliest, most pointless government body ever." I'm not certain from his brief blog post dated today - which can be found at http://singletonblog.dailymail.co.uk/2011/10/is-this-the-silliest-most-pointless-government-body-ever.html - exactly what his complaint is. I get the impression that it may be because the Lyon Court has prosecutorial powers, and has used them against one or more football and rugby clubs which were displaying heraldry which had not been registered in the Public Register of All Arms and Bearings. Maybe he was a big fan of one or more of the teams, and is upset that they had to pay money to register the emblems they were using. Or maybe he just finds the idea of a regulatory body in this area to be offensive to his sensibilities. In any case, he finds the situation to be "Bonkers, utterly bonkers." Yeah, that's so much worse than the situation in England (I am, of course, speaking facetiously here), where the College of Arms has virtually no power at all to protect coats of arms, thus fostering a situation where anyone can design or steal or "borrow" and display any heraldry they like (with the exception of the Royal Arms, which are protected by law). 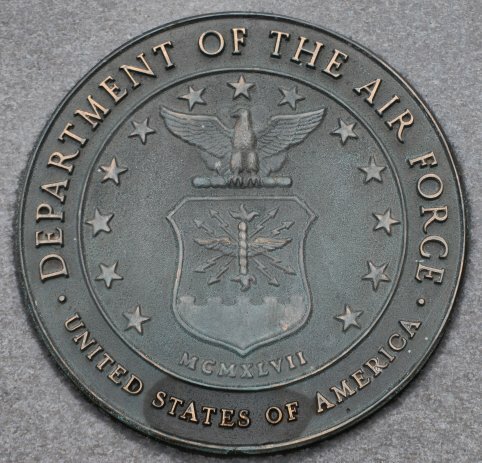 Like the Veterans Memorial in High Point, North Carolina, that I wrote about a little while back (July 21, 2011, http://blog.appletonstudios.com/2011/07/heraldry-found-in-high-point-north_21.html), the North Carolina Vietnam Veterans Memorial on the grounds of the state capitol bears the symbols, sometimes heraldic, of the five major branches of the U.S. military services: the Army, the Navy, the Marines, the Air Force, and the Coast Guard. 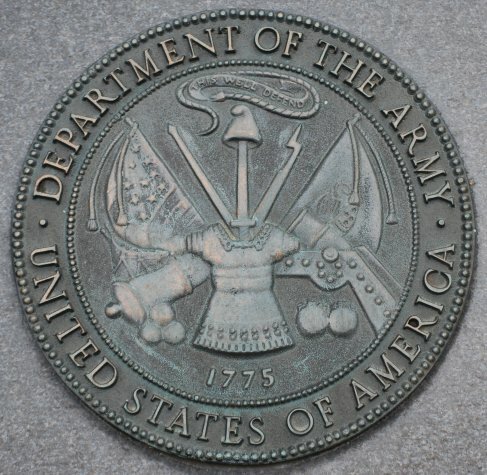 Different versions of the insignia of the Army and Navy are given on the World War II memorial just a few steps away from the Vietnam Veterans Memorial, the Army having the full achievement of arms of the U.S.: a bald eagle bearing the arms of the US on its breast, maintaining a sheaf of olive branches in its dexter talon and a sheaf of arrows in its sinister talon, holding a scroll with the word E Pluribus Unum in its beak, the whole surmounted by a glory breaking through clouds and showing thirteen stars taking the place of a crest. The Navy bears the arms of the US with the addition of thirteen stars on the chief, surmounting two crossed anchors, the shield ensigned by an eagle. 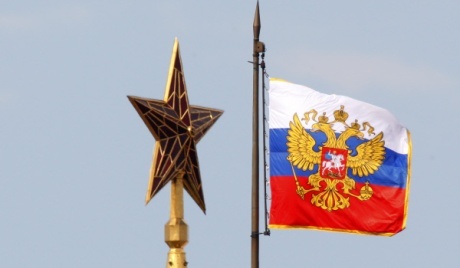 In a recent article in The Voice of Russia (English-language version), it was noted that this year marks the fifteenth anniversary of the adoption of the date when then-President Boris Yeltsin signed a decree establishing the insignia of presidential authority: the standard, or flag, of the President of the Russian Federation, and the presidential emblem. The standard is square with three equal white, blue and red horizontal stripes, gold-fringed about the edges, with a golden double-headed eagle in the center bearing St. George on horseback slaying the dragon, on a red shield. 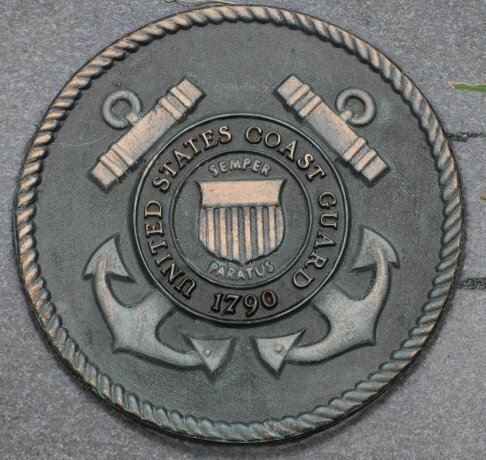 A silver cramp-iron is engraved with the president’s name and the dates of his term in office and attached to the flagpole. Mikhail Medvedev, a member of the Heraldic Council and well-known heraldic artist, says that the composition of the standard took shape in the late 17th century, the time of Peter the Great. This has been a traveling year for us! 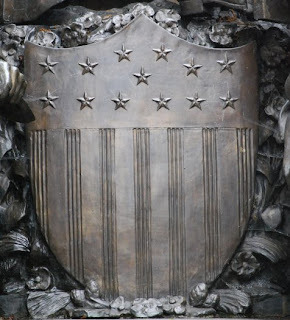 And, once again, wherever we’ve gone, we’ve seen heraldry. 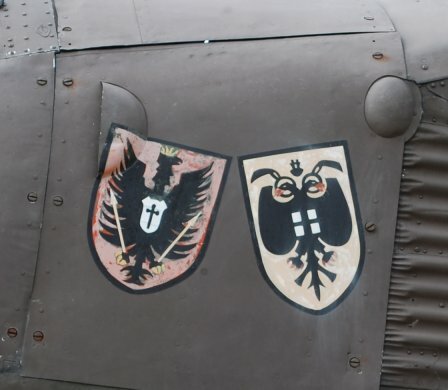 Some good, some bad, some real, some only heraldry-like. 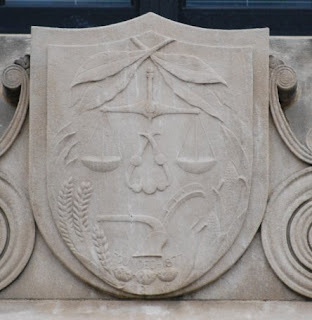 This first one is from across the street from the capitol, on the building of the North Carolina Department of Agriculture, carved over the main entrance. As you can see, it’s an amazing conglomeration of agricultural symbols: in chief, naturally enough, we have some tobacco leaves, as the premier crop in the state. 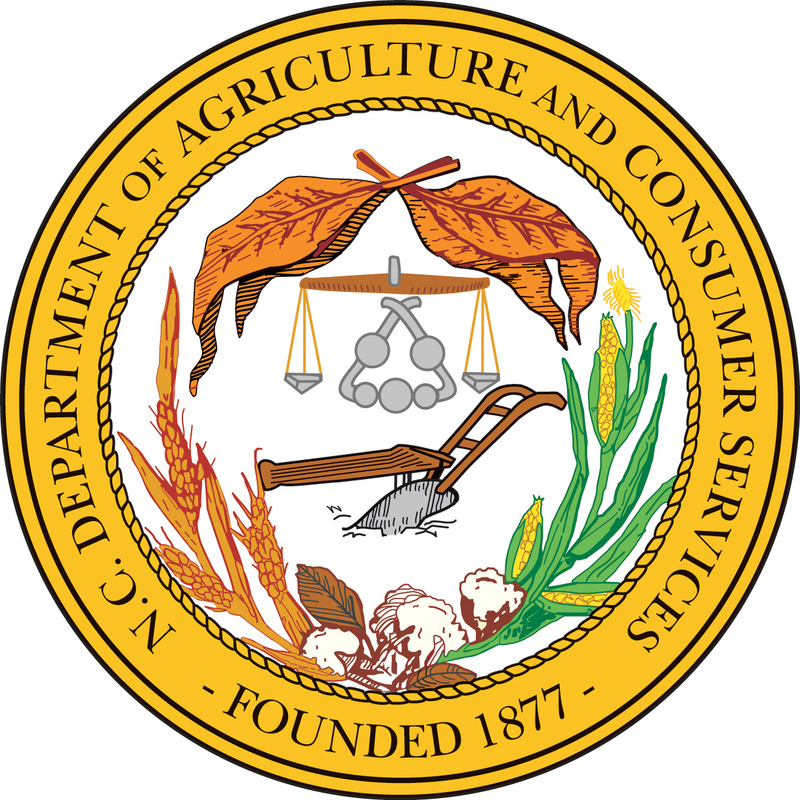 But there are also a hanging balance, a plow in base, and an I’m not sure what in the center (I don’t find a description of it even at the NC Department of Agriculture website, but it almost has to be some kind of agricultural tool), flanked by ears of wheat (to dexter) and ears of corn (maize) (to sinister). Below the plow are the words “Founded 1877" and below that three cotton bolls. 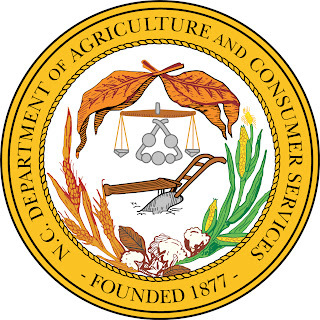 Here’s a color version in the form of a seal rather than on a shield from the North Carolina Department of Agriculture website. There’s a nice (albeit brief) article on-line about the Museum and the Museum of Heraldry Awards at the Constantine Palace in St. Petersburg, Russia. It’s a great little article; reading through it makes me want to go for a visit. 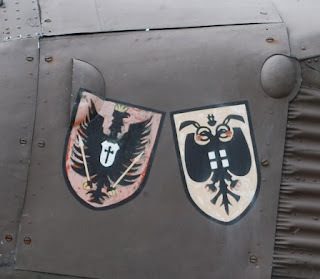 There are some nice photographs of various articles with coats of arms on them, including a very nice set of dinnerware. 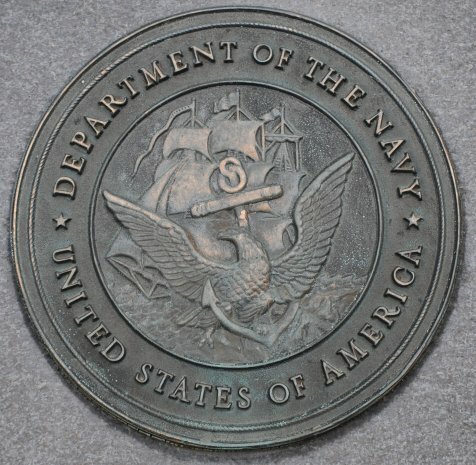 And the article talks about some of the coins in the collection. 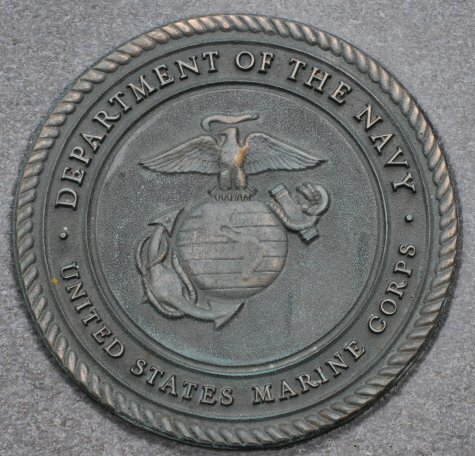 But what struck me was a photograph of some military medals in their collection, one of which is the Purple Heart, the U.S. military medal for those who have been wounded in the line of duty. 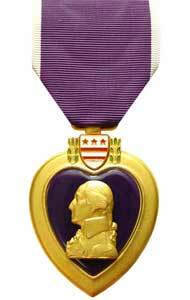 The Purple Heart medal not only has a bust (in profile) of George Washington on its obverse, it also has a depiction of his coat of arms (Argent two bars and in chief three mullets gules, which are also used as the arms and flag of Washington, DC). Not exactly the sort of thing that I would have expected to find in St. Petersburg, Russia. 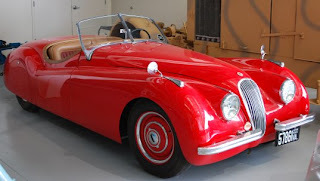 St. Petersburg, Florida, maybe, but finding it in Russia was unexpected. 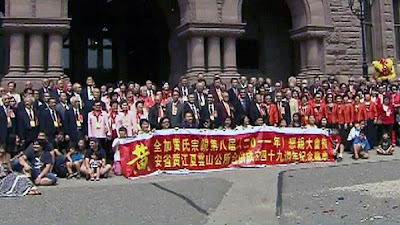 In an article in The Star.com dated August 3, 2011, the Canadian Heraldic Authority has granted an achievement of arms (a coat of arms with crest, supporters, compartment (the bit the supporters - here, bears - are standing on) and a motto) to the Wong Kung Har Wun Sun Association (also known as the Wong association of Ontario). 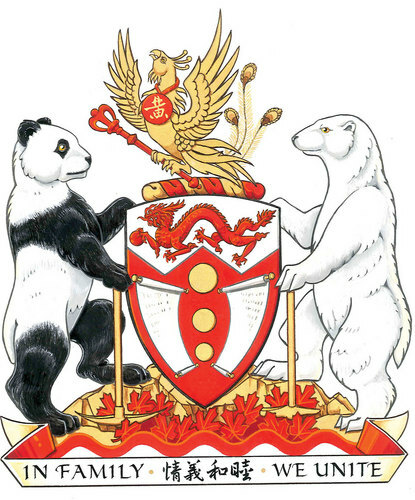 The new “crest” (the paper apparently fell into the same mistake that so many others, including, alas, The Times of London), was officially unveiled on August 13 at the Wong’s National Convention in Toronto. They were expecting about 1,100 people of that surname at the largest gathering of its kind to date. The article also mistakes the arms for the Association as arms for anyone surnamed Wong, though I expect many members to be able to use the arms to show their affiliation with the organization. Additionally, Greg Wong, this year’s event organizer, noted that his personal idea for a motto, “Don’t Mess With The Wongs”, was overruled with “In Family We Unite.” Not as stirring as Clan Macgregor’s “My Blood is Royal,” but certainly appropriate for a family association.